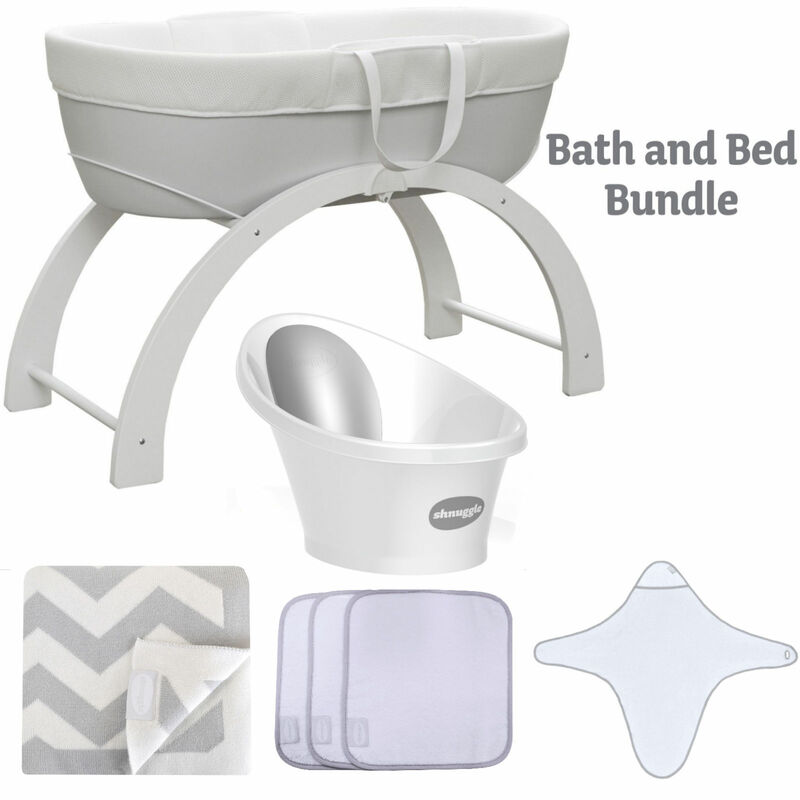 This amazing bath and bed time bundle from Shnuggle provides you with the essentials for baby. The multi award-winning Dreami sleep system designed so that you can keep baby close to you day and night, whilst they remain in their own cosy sleeping space. The Dreami can be used next to your bed for night-time feeds and is easily moved around the home during the day thanks to its handy carry handles and light weight (4kg). Featuring a hypoallergenic, ventilated base which is easy to clean, the Dreami also comes with cotton facing breathable fabrics to maximise airflow and help regulate baby’s temperature. The fabrics are machine washable, as it the removable mattress cover. Also included and with a clever modern design, the Curve Stand from Shnuggle can be used as both a static stand and as a rocking stand.When used in the upright position, baby will be conveniently level with your bed on a sturdy fixed frame. Simply turn the stand upside-down and the Curve is transformed into a low-level rocking stand which is ideal to rock baby into a peaceful sleep. The luxurious hooded towel is ideal for keeping your little one cosy and warm after bath time. With its unique design the hooded towel is made up of soft white cotton with a stylish grey trim and is the ideal shape from wrapping up baby and is soft against their delicate skin.Perfect for bath time and use throughout the day the luxury wash cloths by Shnuggle help keep your little ones hands and face clean. With a super soft bamboo and cotton blend these are gentle on your baby’s delicate skin. The package includes 3 wash cloths ensuring you will always have a spare to hand when the others are being washed. Made from nothing but Oeko-Tex certified 100% cotton, the blankets are ultra-soft, super-cosy and can be used in moses baskets, cribs, car seats and prams (to name just a few) making them wonderfully versatile.